Beach Bars – Locals Only or Melting Pot? Home » Travel » Beach Bars – Locals Only or Melting Pot? About eight years ago, we took a trip to Myrtle Beach for a week. We stayed at a condo at the northeastern tip of Cherry Grove Beach where House Creek spills into the Atlantic. The condo was close enough to North Carolina that we could have swam across the House Creek Inlet to Waites Island (which we did) and walked to North Carolina if the Little River Inlet wasn’t so wide (which we did not). The thing that struck me about the location was how developed everything was to the south and west of our condo and how undeveloped the coast was to the north and east. 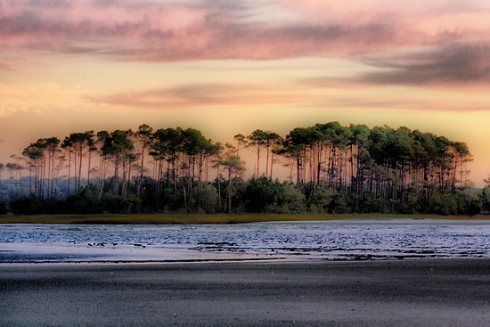 The undeveloped stretch of land was due to Waites Island being under the jurisdiction of Coastal Carolina University and Bird Island State Reserve just past it. Somehow, amidst all the condos and development to the west and south, we were able to find a beach bar in Cherry Grove Beach called Harold’s on the Ocean. We only stuck around for one round of drinks. It was obvious to the people in my party that this was a “locals only” beach bar. Which raises the question – should a beach bar be geared towards a certain set of people or should it welcome everyone in with open arms? I’ve heard arguments on both sides. A true beach bar should only be for locals who can appreciate it and have been loyal customers for years and won’t be herded off island when the big white shiny cruise ship blows its horn and slowly ambles off to its next port of call. Or a true beach bar is one that opens its doors to everyone from all over the world no matter how long they stay, each person with a different background and culture that adds to the beach bar atmosphere and turns it into a melting pot on the beachfront. Where do you stand on the subject? Locals only or a melting pot? What are the advantages/disadvantages? Can a beach bar be both? Photo is of Waites Island. I think a true beach bar can be both…what makes the difference is the staff’s attitude and that of the locals. If they are both welcoming and inviting, then a beach bar can be both for the locals and for tourists. Personally, if I stumble upon a locals bar, I make sure to behave myself, observe how everyone is acting, and tip well, all to leave a good impression. Good point, Corey, and great advice about how to act at a locals bar when you are the “guest.” I think tourists and locals get a bad rap from each other because of preconceived misconceptions based on same “bad apples” from the past. Your attitude is a difference maker and in order to ensure a true beach bar vibe, we should all be welcoming and inviting! Cheers! Interesting question! I’m thinking of the half-dozen or so bars on Green Turtle Cay, Bahamas, where we have a home. Most cater to a mixed clientele. Having said that, many of the “tourists” are repeat visitors, so they’re really more like honorary locals. I can certainly understand why locals in a large tourist town might want a place of their own, but on an island as small as Green Turtle for example, this just isn’t feasible. Thanks for the feedback! That’s excellent information and I appreciate you taking the time to share it. I never considered the viewpoint of repeat tourists being considered “honorary” locals but you make a great point. Thanks and Happy National Rum Day! It seems like you have a lot of knowledge about the local beach bars. If you don’t mind, I’d love to discuss them with you in the future and maybe do a whole article on the beach bars of Green Turtle Cay and the island itself.